I’m all for sentimentality, but it is a bit annoying, particularly in that it comes back after every single upgrade. Every time I upgrade a WordPress site I ask myself “What is the point of this silly plugin?” Yes, it only takes a moment to remove it, by why be bothered with the hassle. Thanks for bringing this up…I can see I’m not alone. I certainly DO spend time “dealing with it”. For some reason I’ve gotten into the habit of deleting it from every single WP site I maintain (literally dozens). And all that time certainly does add up, especially when it annoyingly puts itself back in during upgrades. I’m handling many german WordPress blogs. ‘Hello Dolly’ is rather useless in non english websites and demonstrates exactly one point: the anglo-centric mind of the core developers. While it does hold some sentimental value as the first official WordPress plugin, I would vote for removing it. If we’re going to have a low functionality plugin bundled with WordPress, it should be a better example of how to do basic plugin actions (IMO Akismet is too complicated and Hello Dolly is too simple). The plugin is one of the few reminders in WordPress that it is actually coded by individuals who have personal preferences and passions on my opinion. By leaving the plugin it humanizes WordPress and shows that there are people behind the project. In my opinion: leave it, it’s one of the few projects that still leaves this personal notes, and I love it for that. Leave it. It’s a 2K file. Just writing these comments cost each of us more energy than it would take to delete it. It’s a friendly wink from the WordPress developers that says join us and maybe let yourself have some fun with code. Look, what everybody on here against the plugin is forgetting is that it’s not there for them. It’s for beginners, and for them, it serves a number of useful functions, including (a) directing them to the world of plugins to begin with, and (b) providing a really simple example of how a plugin is coded. It’s not just a sacred cow. I first learned how the plugin system works by viewing the source of Hello Dolly. It’s simple enough that you can crack it open and clearly see the basic building blocks for building plugins. There were also some great comments posted at the discussion on this topic over at WPTavern. Thanks for linking over to the discussion on WPTavern. A number of people who read the site are consultants with clients who hate seeing that plugin. The results speak for themselves though. However, the only way that plugin will be removed is if Matt says so. Don’t see that happening anytime soon. If anything, it would be nice to be able to permanently delete the plugin if it is not wanted, such that it would not re-appear with each new WordPress update. I think something like that would make the upgrade process cleaner and easier for everyone. WordPress core would be lighter than ever; can even compete with v1.5 :). They could even set seperate update options (NOT plugins) for stuff like jQuery, Scriptacuolus, Thickbox etc.. That way, users can be up to date and wouldn’t worry about weird/malicious flaws and whatnot. Would it be too much to ask if I wanted you to open up another poll about this issues, Jeff? I think Chris is doing the next poll, but after that, it’s definitely a possibility. It would be interesting to see what others think of these ideas. I think there should be a way to delete multiple, inactive plugins at the same time. Hello Dolly is of no use to me, but I don’t want to delete each plugin one by one if I can help it! Baris, you should support this ticket I’ve opened. I agree that TinyMCE is bloated and the functionality could use an upgrade too. A compromise should be made. If the user wants to delete it once and for all, have a delete permanently button and a leave it alone button. If upgrades where made, the protocol would be followed whether to not have it or to have it. I still stand by my comments at WPT in support of removing Hello Dolly. 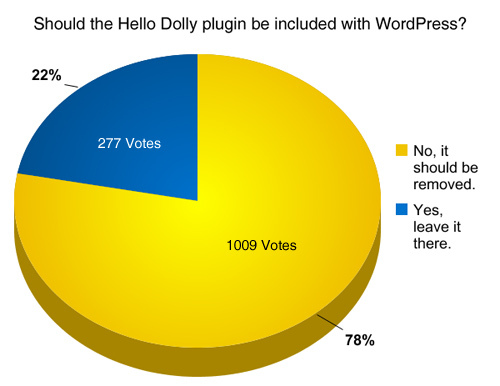 I would like to add, though: Hello Dolly is *only* useful to plugin developers (if at all). It is not at *all* useful to normal users. So, what percentage of WordPress installs represent plugin developers, versus general users? One percent? There is absolutely no reason whatsoever that a plugin useful less than one percent of the install base should be installed by default. I rank the default inclusion of Hello Dolly up there on my list of pet peeves with seeing random travel pictures from ma.tt in the official Planet WordPress feed.